RhinoForYou presented Geometry Gym BIM enhancements for Rhino3d / Grasshopper3d at the BIM Day event in Paris earlier this week. It was a good opportunity to enhance and improve the IFC plugin testing IFC files generated with other software. Improvements have been made for file processing times (with more to come, but better for all IFC authoring software to produce higher quality files). 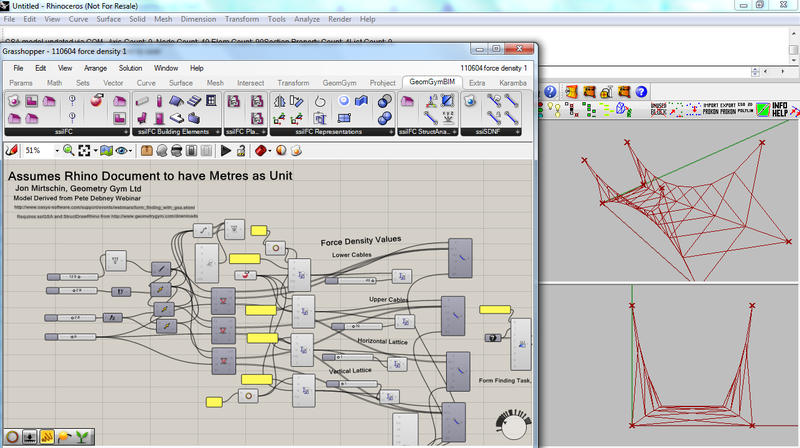 This clip shows importing of the Tekla House model authored in Archicad, and an associated MEP file. 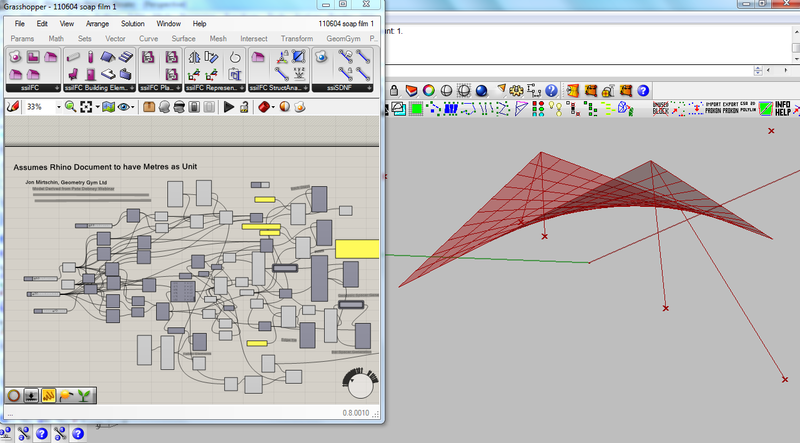 It demonstrates the new IFC tree data viewer in Rhino. The second clip is a model prepared by VisualARQ, the IFC data was optimized using Geometry Gym tools to reduce the file size by a factor of 10 (permitting more acceptable access time for Rhino/Grasshopper). The file is then imported and edited in Grasshopper, first deleting some members and then generating a new parametric set. This plugin is undergoing continual improvement, if you have requests or requirements that you would like included, please get in touch to discuss them with me. I think it's a great resource and introduction/explanation of some of the form finding options provided by the Oasys GSRelax solver. I also think each of the 3 example models are well suited to a parametric exploration using Grasshopper (using the Geoemetry Gym plugin to exchange the model data with GSA), and I'm posting these definitions here so you can try for yourself. The gsa relax solver is not included in the standard evaluation license, but you can email them and ask for access to it. I'm still enhancing the plugin in a few areas, you might see toolbars wander if you run GSA as a background service (ie if you don't have GSA running when you open the grasshopper definition, the plugin will start it in the background for you). If you do have GSA open and Grasshopper appears to "freeze", activate GSA and close any confirmation dialogs that might appear. Generating the model with geometric shapes using BullAnt will be enhanced shortly, as well as any user requests so send them through. 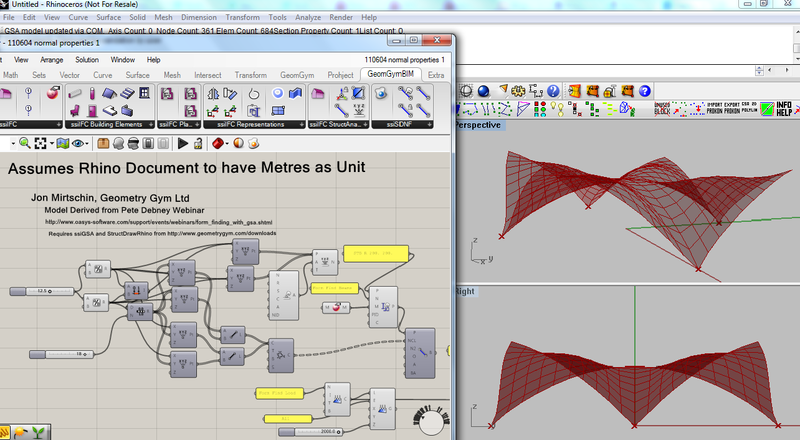 Make sure you have latest GSA and BullAnt plugins from here: http://www.geometrygym.com/downloads and the definitions are derived on the basis of a rhino document being open with metre units. I've been enabling Rhino version 5 light weight extrusions to the Geometry Gym Rhino plugins, that uses less memory, meshes faster and saves out to much smaller file sizes. I've seen and heard some positive demonstrations and reports of this improvement, but decided to do some quick bench marking for myself and the results are impressive. I prepared some approximate models of the British Museum Great Court Roof as part of this discussion with importing IFC models into Archicad. The model comprises 5180 members, and the improvements from v4 to v5 are really impressive. 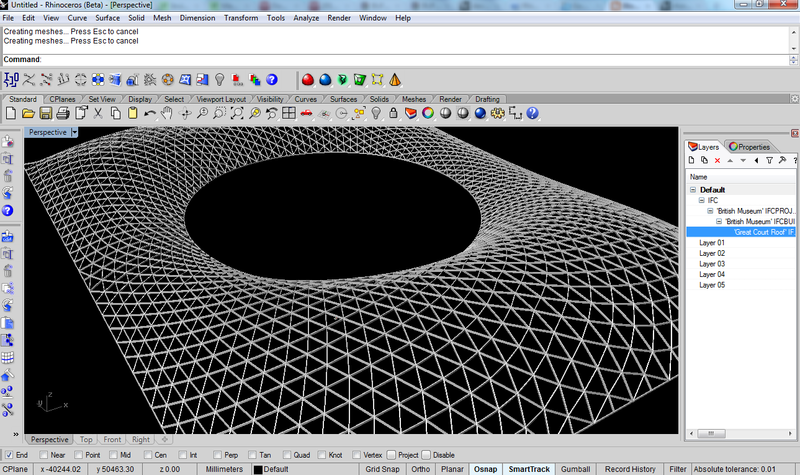 I've benchmarked using the Geometry Gym IFC importing plugin, which will use the new extrusions when running in v5. If you want to try for yourself, install/update the plugin, http://www.geometrygym.com/downloads and the IFC data file can be downloaded here. Or, if you just want to open the rhino model, download here. Time wise (only considering the generation of the extrusions, ignoring file reading time etc) it took 35 seconds on my computer to generate 5180 version 4 extrusions. In version 5, it took less than a second. When saving out the rhino model, version 4 produced a file 74 MB, version 5 produced a 3 MB file. And there is very little lag or delay when panning, zooming and rotating the v5 model, in comparison with v4. The only drawback (which should be a temporary matter and improved as the beta version of 5 progresses) is a much slower start up time for version 5, particularly 64 bit (which seems to be made slower by loading geometry gym plugins which is being investigated). However, if you're working on skeletal or frame models, I strongly recommend taking the step up and using v5. 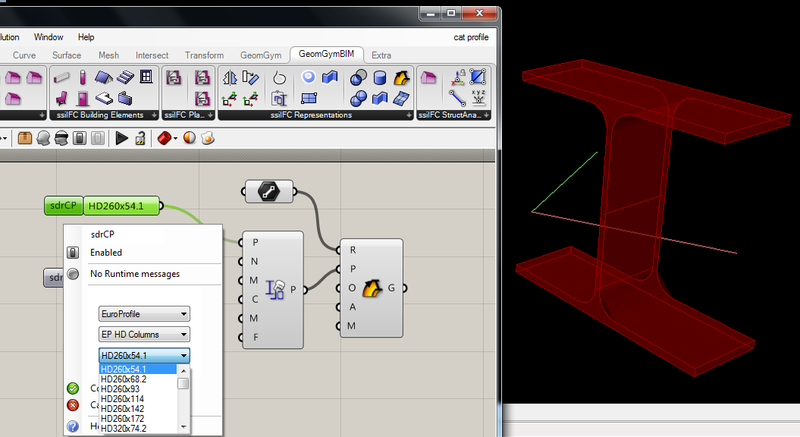 Extrusion elements also can accomodate end miter planes, which I'm in progress of enabling to the plugins. With regards to the IFC plugin, you might also notice some other speed improvements when importing large faceted brep models generated by other BIM software. Feel free to comment with any suggestions or observations of your own.